Hi everyone, it’s Nicole again! I’m the very first queen bee for our very first guild bee. How exciting! Are you all ready to start? Hopefully, what I’ve planned for this month will be a good way for everyone to get their feet wet. If any of you follow me on Instagram (@babydoxie) you already know the answer to this question! What’s not to love about the amazing mother/daughter design duo of Bonnie & Camille who make the sweetest fabrics for Moda. 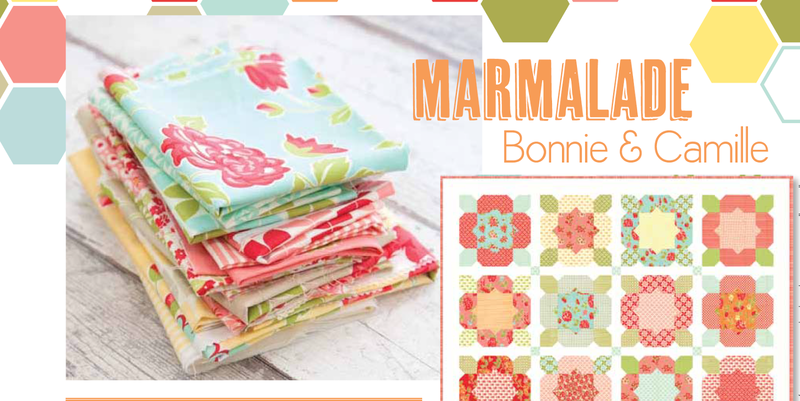 You can check out Camille’s blog or Bonnie’s shop for tons of amazing inspiration! Well, you may have guessed it…Bonnie & Camille strikes again! 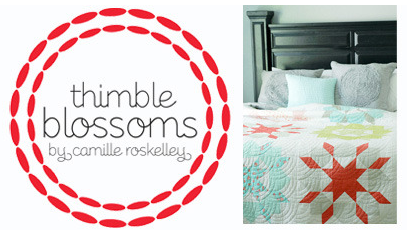 This time in the form of Camille’s pattern company—Thimbleblossoms. You may be familiar with the Swoon quilt. I just love it! In fact, I’m working on a second version now! The Swoon block finishes at 24” so just a few blocks and you’ve got a whole quilt. Ever fabric combination I’ve seen in this quilt pattern is just lovely! 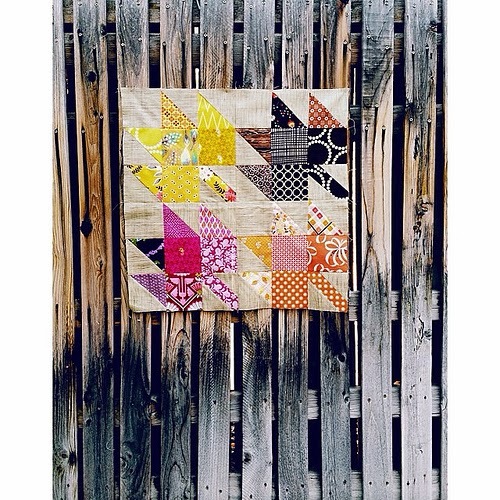 The Swoon quilt pictured below is from the header of Camille’s online pattern shop, where you can get your very own copy of the pattern. Ok, so now that I have professed my undying love for all things Bonnie and Camille…we can get on with the block information for our guild bee! 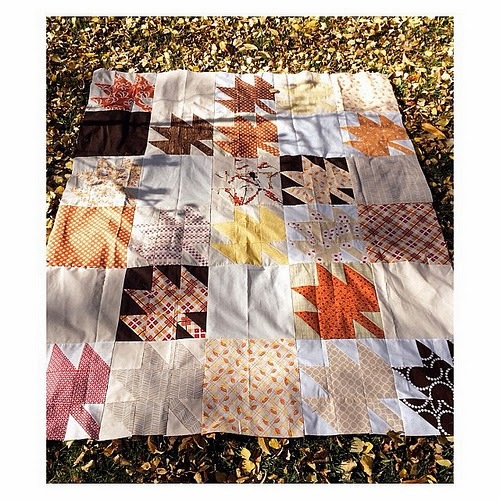 Back in the fall there was a very popular Instagram hash tag #fallingformodernmaples and every single quilt that popped up was just gorgeous. Check out the original tutorial here on the Modern Handcraft blog. Hopefully this is a simple enough block that everyone feels comfortable completing. Also pretty timely too, since AnneMarie just did a demo on several ways to make half square triangles! · Fabric selection: the prints she chose are what I would call “blenders” or fabric that is predominately one color, yet still has a pattern and is not a solid. · Scrappiness: Notice how almost every square is different. I love how it looks here. But it’s important that each leaf is composed of a single overall color. For the background fabric, anything in the cream or tan family is fine. It can be a solid or it can have a slight design to it. Low volume prints work great for this block. Erin also made a full-size version of the quilt and you can see in her picture how lots of different background fabrics were used. There you have it. I’ve ordered up one modern maple block using the tutorial linked above. If you’re just loving this block, feel free to make me more than one! I will accept them all! I can’t wait to see your completed blocks at the February meeting. A special thanks to Erin, who kindly gave me permission via Instagram to use her photos in this blog post!